May is almost over. Can you believe it? I’ve been working feverishly to meet an editing deadline for a box set that’s coming out in June. I finally got where I need to be with that story only to look at my calendar and realize the next deadline is now upon me. And I need to get writing. So I shall be locking myself away in my writing cave for the foreseeable future so I can pull this next story together. Wishing you a marvelous Sunday! Tammy Francis is the winner of Blown Together from Janet W. Ferguson’s post. Monday – Narelle Atkins discusses trigger warnings in Christian fiction. Tuesday – Jolene Navarro talks about her love of water and how it shapes her writing. Wednesday – Elizabeth Maddrey asks for reader input about street teams. Thursday – Heather Gray shares more about what she’s learned from being a writer. Friday – Lee Tobin McClain has a fun quiz for readers. Saturday – Merrillee Whren hits on the fun and folly of international travel. I am a one at a time kind of person but I struggle a lot on focusing and getting to the end result. I have a exam I need to take but I can’t focus because I am easily distracted😩. So I understand how much harder it has to be for a writer who has even more deadlines than I do. How do you guys stay focus and on track? What do you eliminate to meet deadlines? Hi Heather. To meet deadlines, I make a to do lost and prioritize. As a young mom, pastor’s wife and teacher, a kind mentor told me to always do the most important thing first or what you dislike doing first. Helped keep my sanity over the years! Happy Sunday and best wishes! 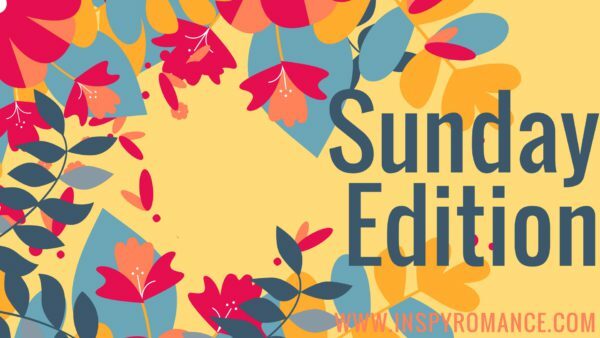 Thanks for hosting Sunday Editions in May, Heather! You are much appreciated. They say multi-tasking is a myth. That we cannot, in fact, do more than one thing at a time, at least beyond that whole breathing, walking and talking thing! I do best with one major project at a time, too, though sometimes I block out mornings for one project and afternoons for another. I am a mess at proritizing. I have multiple to do lists written in a notebook and on Evernote. I have been retired for a couple of years so I’m not as frenetic about my to-do lists as I was. I still make them and lose them. I tend to put things off and do things at the last minute. I’m a good planner – just not as good an executor! I only have one real responsibility– lead a Bible Study but we rotate leaders every week. Household chores are split between my husband and me but he takes on quite a lot….he cooks because he wants to measure everything for health reasons. I sew and make jewelry for fun and charity , so my to do list is mostly what gifts I want to make before someone’s birthday or for Christmas, or for the Country Store at Church. My book reading has taken a turn for the worse. I’m in the middle of several books now. 1. I spend too much time on Facebook. 2. I am in some reading challenges and sometimes find it hard to get the books that are on the challenge and then finish them on time. 3. I request my library purchase books— but they all come in at once and I’m first in line to check them out! I liked it better when I could choose what to read when I wanted to! I guess I still can do that if I don’t obsess over it! Thanks for this thought provoking post ! Ha! Too many books to read all at once. I’ll call that a happy problem. ^_^ But to be honest – I have a hard time reading someone that I’m told to read. I did it so much in college that when I was done…I just didn’t want to do that anymore. I read what I want to read, and I enjoy every minute of it. The only exceptions I make are when I’m doing a beta read for another author – then I fit that in to be a good help to them. But I only do that for people whose writing I enjoy to begin with, so it’s not great hardship. ^_^ Enjoy your retirement, your lost to-do lists, and the plethora of books that beg to be read! I, too, am a one-book or one-thing-at-a-time person. I can do maybe two or three things well at one time but then I get off track and forget what I was doing originally. But definitely only one book at a time :-) I don’t see how some people can do more…lol! Happy SONday everyone! I hope to be around a little more now that I’m caught up on my reading. Blessings! I used to be a very organized person, before kids and before I quit work to stay home with said kids, lol. Today, I’d probably have to do one thing at a time, though it depends on what it is. I spend a lot of time playing games and reading. Some games I can read a bit in between what’s going on. For anything that needs total concentration I have to do one thing at a time, and I can not read more than one book at a time. I also used to be very organized pre marriage and child, and while I may juggle a few things at a time, I’m hesitant to say I’m a multi-tasker. I do enjoy your writing and hope that your story goes together smoothly.